Barbara Nickless is excited to report that Dead Stop won the Colorado Authors’ League Writing Award for genre fiction and is a finalist for the Daphne du Maurier Award of Excellence in the mainstream mystery category. Falcon’s Prey, Book 8 in Terry Odell‘s Blackthorne, Inc. series, will be released this summer. Police officer Lexi Becker feels she is being targeted by a drug lord known only as The Falcon, who she believes was responsible for the death of her husband two years before. Afraid her local police department has been infiltrated by The Falcon, she turns to her former patrol partner, ex-cop Marv “Fish” Frisch. They go into hiding but Lexi exposes herself when she leaves Fish’s protection to go to the aid of an orphaned child. Now she’s on her own, a prime target for The Falcon…unless she can outsmart him. Bruce Most will be signing his murder mysteries as part of BookBar’s Local Author Happy Hour from 5-6, June 9. BookBar is located at 4280 Tennyson St in Denver. Lise McClendon will be the guest at the June literary salon presented by Mystery Readers Journal in Berkeley, California. Lise is the author of five books in the Bennett Sisters mystery series. The series begins with Blackbird Fly; the latest is The Frenchman. That novel spawned a bonus novella ‘written by’ the main character, Merle Bennett, a gothic mystery called Odette and the Great Fear. The next installment releases this summer. She wrote two mystery series, the Alix Thorssen and Dorie Lennox mysteries set in Jackson Hole, Wyoming, and World War II-era Kansas City (The Bluejay Shaman; One O’clock Jump). She also writes stand-alones as Rory Tate. Jump Cut is a romantic thriller set in Seattle; PLAN X is a Shakespearean thriller featuring a Montana policewoman. In 2015 she released (as Thalia Filbert) the darkly comic culinary thriller she wrote with four other well-seasoned crime writers, Beat Slay Love: One Chef’s Hunger for Delicious Revenge. The event is free but RSVPs are required so, for those who might be in the NorCal area and wish to attend, send an email to janet@mysteryreaders.org. A Sharp Solitude, Christine Carbo‘s latest novel in her award-winning series, was released May 29. In the darkening days of autumn, a woman’s body is found in the isolated terrain near Glacier National Park. The victim was a journalist who had been interviewing reclusive researcher Reeve Landon about his work for a program that trains dogs to track scientific data. Now Reeve is the prime suspect. Without friends or family to turn to, Reeve seeks help from his ex, FBI agent Ali Paige, mother of their young daughter. Then, assuming the worst, Reeve flees into the woods with his dog. As the evidence mounts against him, Ali isn’t sure how far she’ll go to find answers—and what if the truth is more than she can handle? John E. Stith’s Pushback has been scheduled for hardcover and trade paperback in November from ReAnimus Press and ARCs are available. At his ten-year high-school reunion, a Colorado Springs investment counselor finds he doesn’t know one person there, and soon realizes he must outwit an unknown antagonist who wants him dead. Noir at the Bar, Bookbar, 4280 Tennyson Street, Denver. Join us for a few hours of crime fiction read by writers on April 21, 2018 at 7 PM. “Santa Fe Mourning,” March 2018 from Crooked Lane by Amanda Allen (first in the Santa Fe Revival 1920s Series), I will be doing signings and readings at Page One Books, Albuquerque NM, March 18 at 3:00, and Op.Cit Books in Santa Fe April 8 at 2:00. I’m attaching a pic of the cover, plus the link to the book on Amazon if more info is needed. Catherine Dilts appears in Blood and Gasoline, the newest anthology from award-winning Hex Publishers. Her short story Do Over is a tale of vengeance, and a survivor’s hope that enacting justice can erase a painful past. John Hartness describes Blood and Gasoline, with a release date of May 1st, as Mad Max meets Sons of Anarchy. Jeffrey A. Lockwood’s MURDER ON THE FLY was released by Pen-L Publishing on December 30, 2017 and is available on Pen-L, Amazon, B&N, Smashwords, Kobo, and Scribd. Ausma Zehanat Khan’s fourth Khattak/Getty mystery, A DANGEROUS CROSSING (St. Martin’s Press, Minotaur Books), is out February 13, 2018. She’ll be at the Tattered Cover-Colfax for the launch on February 15 at 7 p.m, and on the panel “Women Write Truth to Power,” at the Colorado Book Festival on March 3 at 1 p.m, at the Denver Public Library. The 2018 Lefty Award nominees have been announced: THE WOMAN IN THE CAMPHOR TRUNK by Jennifer Kincheloe (Seventh Street Books) has been nominated for Best Historical Mystery and THE ART OF VANISHING by Cynthia Kuhn (Henery Press) has been nominated for Best Humorous Mystery. RT Reviews has named HUNTING HOUR (Crooked Lane Books) by Margaret Mizushima a 2017 RT Reviewers’ Choice Award nominee in the Mystery/Thriller/Suspense category. See photos of Mystery and Mistletoe here. Christine Carbo’s second novel in her Glacier Mystery Series, Mortal Fall, won the 2017 High Plains Book Award in the category of Best Woman Writer. The High Plains Book Award considers all types of literature from authors who examine and reflect on life in the High Plains: Wyoming, Colorado, Montana, South Dakota, North Dakota, Nebraska, Kansas, and the Canadian provinces of Saskatchewan, Manitoba, and Alberta. 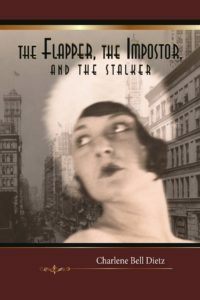 The Flapper, the Impostor, and the Stalker, by Charlene Bell Dietz, will appear on bookstore shelves this December. In 1923 when college-bound Kathleen McPherson, of Minneapolis, pushes her family’s traditional boundaries, she discovers a stalker intent on killing her. Kathleen runs away to Chicago to escape the knife-wielding stalker and to find happiness as a flapper. Instead of an entertainer’s life full of fun and frolic, Kathleen encounters deception, death, heartbreak, and revenge. Not only does the stalker continue to pursue Kathleen, but she now must escape being murdered by the mob. In November, The Flapper, the Scientist, and the Stalker received a Kirkus starred review. “Readers will initially settle in for a standard mystery….But when the appealing Kathleen and Harold take over things, this story becomes more than a simple whodunit—it delightfully turns into serious literature. Readers should hope for more captivating novels from this promising author.” Click to read the complete review. 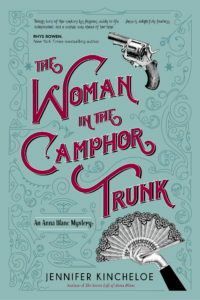 Jennifer Kincheloe’s new novel, The Woman in the Camphor Trunk: An Anna Blanc Mystery, is coming to audio this month featuring Audie, Earphone, and Audible Book-of-the-Year award-winning narrator, Moira Quirk. In early-1900s Los Angeles—an era of courting, ragtime, suffragettes, and widespread corruption—a socialite turned police matron tracks down the murderer of a white woman in Chinatown, while trying to prevent the outbreak of a bloody tong war. On November 17, Patricia Smith Wood won the NM/ AZ Book Award for Best Cozy Mystery for 2017, for the third book in the Harrie McKinsey Mystery Series—Murder on Frequency. Congratulations to Pat! Robert D. Hughes’s new novel Bone Mountain was published in October by C J Keenan Publishing. “Bone Mountain is a hella fast-paced high plains thriller.” —Elwood Reid, Executive Producer of the hit FX series, The Bridge. Bone Mountain is available on Amazon as a trade paperback and e-book. For details, visit https://www. robertdhughesauthor.com. Carter Wilson’s upcoming novel Mister Tender’s Girl (Sourcebooks Landmark, Feb 2018) was optioned for a television series by Legendary Television, a division of Legendary Entertainment (Batman Begins, The Dark Knight Rises, Inception). His current release, Revelation, just co-won the 2017 Rone Award in the Thriller & Suspense category. Pat Stoltey announces the release of her historical mystery, Wishing Caswell Dead, in hardcover and ebook from Five Star/Cengage. Publishers Weekly called the novel “…a worthy historical” and described the characters as “surprisingly complicated and wonderfully individual.” The novel is set in the early 1800s in the fictitious Village of Sangamon on the Illinois frontier. WELCOME to new members Ausma Zehanet Khan and Susan Waller Lehmann.